GATE is (and always will be) free, but machine time, training, dedicated support and bespoke development is not. Using this site you can rent cloud time to process large batches of documents on vast server farms, or academic clusters. You can push a terabyte of annotated data into an index server and replicate the data across the world. Or just purchase training services and support for the various tools in the GATE family. You can't get a decent cup of tea here, but we're working on it. We're the only customisable solution (we support a bring-your-own-annotator option -- a GATE pipeline -- as well as pre-packaged entity annotation services like other systems). Getting started takes a few minutes and a few euros -- come on, what's stopping you?! You have some text, you want to annotate and index it automatically. You want to deploy text processing as part of a robust and maintainable semi-automatic process. You want training, support, maintenance or bespoke development. 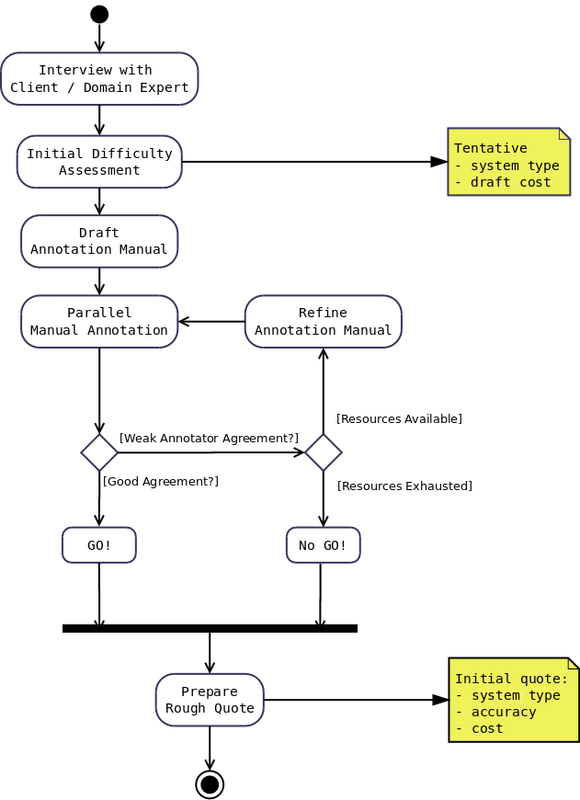 GATE Developer is the best way to build annotation (aka information extraction, text analytics, or semantic annotation) processes -- you can DiY, or hire consultants, or take one of the existing ones. Then you run it over your text and pump the results into an index server -- perhaps Apache Lucene or GATE Mímir. Successful annotation projects (and successful search projects, and just like successful software development in general) need to cater to a range of stakeholders within the organisations that they are built for. From the initial commissioning of a system through its specification, implementation, acceptance testing, deployment and maintenance, many skills, interests and roles are involved. 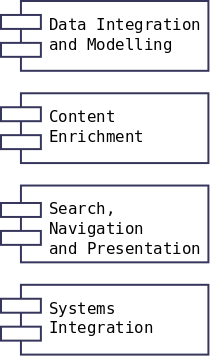 The process is supported by software (notably Teamware, but also GATE Developer and Embedded), but it is not just based on tools: it encapsulates expert knowledge and the use of that knowledge to build, educate and direct multi-role teams whose work involves the complex workflows (or business processes) necessary to do text analysis (etc.) in a cost-effective, sustainable and accurate manner. The outcome is predictable and repeatable engineering processes to address diverse text processing problems. 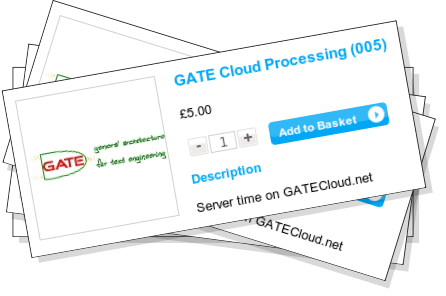 Buy GATE Teamware servers in the GATECloud.net shop. Before you can buy any of our cloud based offerings you need to create an account on GATECloud.net, use the Register link at the top right of any page and follow the instructions. Once registered and logged in you can browse through the shop and decided on the services you wish to purchase. The shop doesn't handle money but works instead with vouchers bought from the University of Sheffield's on-line shop. Vouchers are available in multiples of £5, the amount you need to purchase will depend upon the services you wish to use. Once you are ready to buy time on GATECloud.net create an account with the University shop and then buy the appropriate amount credit vouchers. Be sure to use the same email address when buying vouchers as when registering for a GATECloud.net account so that credit you purchase can automatically be added to your GATECloud.net account. Once you have enough credit you can click through to the checkout where you can review your basket before finalizing your order. Annotation job purchases should appear instantly within your dashboard. Teamware servers take a little longer to create and we will e-mail you when the server is ready for use. All past purchases can be monitored and controlled via your dashboard. A last word on pricing: the underlying software is all open source, so there's nothing to stop you rolling your own if you can't afford the cloud costs. Our terms and conditions, including confidentiality provisions, are specified here.